Tonight, President Serzh Sargsyan at the A. Spendiarian Opera and Ballet National Academic Theater was present at the Haykian award ceremony which is aimed at the finding and appreciating the individuals and structures which during the year have made a considerable contribution to the youth affairs. This time the traditional Haykian award ceremony of the Youth Foundation of Armenia was dedicated to the 25th anniversary of the creation of the RA Armed Forces. Haykian-2016 awards were presented in a number of nominations – Best Selfgoverning Student Body, Best Sporting Student Selfgoverning Body, Best Youth Public Organization in Yerevan, Best Youth Public Organization in Marzes, Most Original Youth Project, Best Youth International Project, Best Youth Program, Best Military and Patriotic Project, and Most Prominent Youth Scientific Achievement. Beside the traditional nominations, there were established also special prizes which were handed to the awardees by President Serzh Sargsyan. A special prize was awarded to Constantin Enkoyan for initiating the Noble Days in Yerevan scientific event, Tigran Kocharian for organizing the What? Where? When? intellectual game World Championship in Armenia and for the development of the intellectual movement, to the UN Joint Program on HIV/AIDS organization in the Most Supportive for Youth International Organization category, Arthur Alexanian for dedication and considerable contribution to the development of sports and, Henrikh Mkhitarian for the considerable contribution to the development of the Armenian football and propagation of the Armenian sports. Haykian -2016 special award was also given to 47 servicemen who in 2016 received the RA Military Cross of the First and Second Degree. The Haykian awardees along with the symbolic statuette received also Armenian ArmTab tablets. 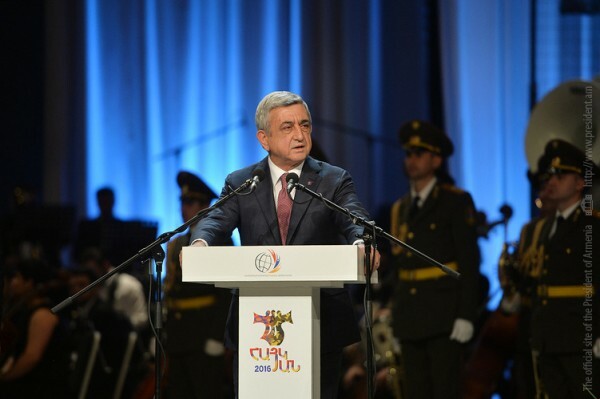 At the conclusion of the award ceremony, President Serzh Sargsyan congratulated all participants, stressed the importance of this traditional undertaking and wished them every success. In presence of you all, I would like to thank the organizers of tonight’s beautiful event for the opportunity to meet with you today because meetings like this one always inspire with new vigor, new energy. I always meet with great pleasure with young people – military servicemen, scientists, or our Party members. This is also the opportunity to chart our course more precisely, to make adjustments to our work. With sorrow but also pride I certainly congratulate our troops who died as heroes defending the borders of our Fatherland and their parents. With sorrow, because they are not with us, or to be exact, are not present in this hall, but also with pride because we are dealing with the people who have dignity, sense of duty, who have strong patriotic feelings. I certainly congratulate the other awardees: their story is a story of success, and I believe that award ceremonies such as this one, are very important because we have to identify and present to others the best of our best – the individuals who through their diligence, talent, and abilities are able to achieve success. I don’t believe the saying, which especially the parents like to tell their children, that a bad example is infectious. It is not true; a good example is much more catching, and we have to ensure that these good examples become attractive for others, something to strive for. For that very reason, I wish you all success and would like to say publicly once again to all those discontent, all pessimists, who claim that Armenia has no future, that the answer is your work, our today’s youth, and their achievements. Thank you all very much, and I wish you every success,” said President Serzh Sargsyan in his welcoming remarks.